Gates are up permanently, and can be used year round. Water conditions vary from flat to massive, when play boaters also become interested. Coached slalom sessions from British Canoeing Coach (Shepperton SCC) Div 3/4 and Div 1/2 are Tuesdays from 18.00 and Saturday mornings from 10.00. Also informal training sessions from a ranked Premier paddler most Mondays, Wednesdays, and Thursdays from 18.00. Shepperton Slalom Canoe Club holds all of its events on the River Thames, on Lock Island at Shepperton, Middlesex. The river is controlled over the course by a weir, allowing the club to run almost all division events at some time or other during the year. When the gates are fully open, it presents a real challenge to even the most accomplished paddler – with possibly the best wave (at least) in the South of England. Play boats love this too. 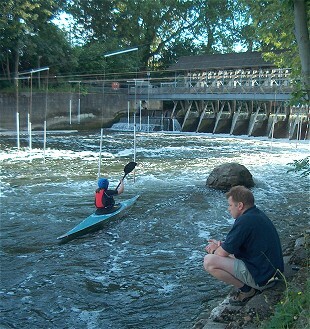 At the same time, when the gates are closed, a challenging flat water introduction to the novice is created by staggers and tight turns across the face of the weir. To get to the Weir from Shepperton, take the road south past the church, and turn left into Ferry lane, or from the south go over Chertsey Bridge, at mini roundabout turn right towards Shepperton, then second right to Church square and then first right into Ferry Lane. Park by the lock (considerately please!) walk over the lock gates, and you are there. From the M25 Chertsey (Junction 11) turn onto St Peters Way (A317) signposted Chertsey. At the roundabout take the first exit onto Chertsey Road (A317) signposted Chertsey. At traffic signals continue forward onto Fordwater Road (B387) signposted Fordwater Industrial Estate. At the next traffic signals, turn right onto Bridge Road (B375) signposted Shepperton. Cross Chertsey Bridge and at the roundabout take the second exit on Chertsey Road (B375). After about half a mile, take the right fork (continuous) onto Chertsey Road and then the next right onto Ferry Lane. This takes you right down to the river and onto Towpath. Park and walk across the lock to the club house.